The term bombogenesis, colloquially ‘bomb cyclone,’ describes a rapidly intensifying weather system spurred by a steady drop in atmospheric pressure over a period of 24 hours. Founded in the midst of such a storm in January 2018, Bomb Cyclone addresses the rapid deterioration of global climate infrastructure and international relations over the previous year. As a journal of art and literature, we provide a critical space for re-imagining our natural, built, and social environments as changing weather patterns, rising sea levels, and nuclear arms races intensify and become global existential threats. To that end, we are committed to uplifting and engaging marginalized voices through publishing poetry, prose, and literary translation by emerging and established writers alongside dynamic mixed media arts. The nature of ecopoetics—a dialogue between land, air, water, and song—is unavoidably both personal and political, local and global. Environmental factors impact us according to other dimensions of our lives—including race, ethnicity, gender, class, and ability. 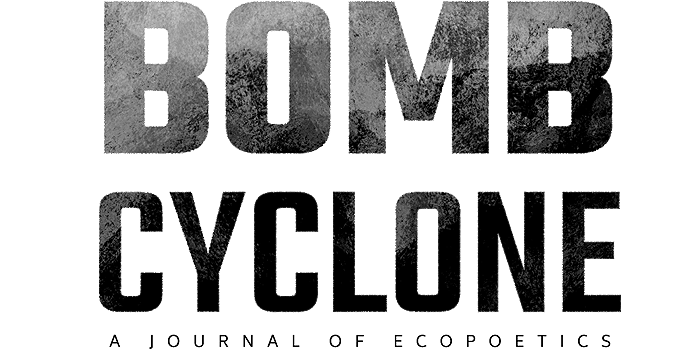 At Bomb Cyclone we view ecopoetics through an intersectional, international, and interdisciplinary lens; patriarchy, white supremacy, and colonialism are environmental issues under late capitalism. If your work investigates ethics of personhood, place, and identity, we want to read it. We especially seek submissions from women, queer and trans artists, artists of color, differently-abled artists, and those whose identities intersect with more than one of these margins. Valentine Conaty is a Birmingham-grown artist and editor based in Queens. She has curated poetry and visual arts for Loose Change and founded Bomb Cyclone. By day, she supports poets, presses, and literary organizations in planning events at Poets House, among the nation’s largest public poetry libraries. Recent work can be found in Anomaly, The Operating System’s Ex-Spec Po series, and Glass Poetry’s Writers Resist series—and elsewhere, under various former aliases. Her interests include popular music, contemporary sculpture and installation arts, and built environments of the American South. Catty Donnelly is a voice actor, illustrator and composer from New York. They are currently working on a new musical, but it’s coming slowly, so don’t hold your breath or anything. Allya Yourish is a poet and Fulbright grantee currently living in a small town in rural Malaysia. In daily life, she stumbles through the few words of Bahasa Melayu she knows and finds poetry in the constraints of her new vocabulary. Before being where she is today, she lived in Portland, Sarasota, and New York, in that order. She does not know where she will live next. Amelea Ying Ying Ng is a Chinese-Malaysian poet, multimedia artist, and educator. Formerly based in Shanghai, Portland, and NYC, Amelea currently lives and teaches in Perak, Malaysia. Phoebe Kaufman, a recent graduate of Pomona College, writes about contemporary and medieval poetics, Jewish philosophy, and holes. She lives in Brooklyn and is currently employed.